Identify the parts in the drawers: choose a category (or enter a new category in the 'other' field), enter part values, description and possibly datasheet (sometimes you have to find the datasheet to know what something is. Use OctoPart, DigiKey or Mouser to help. 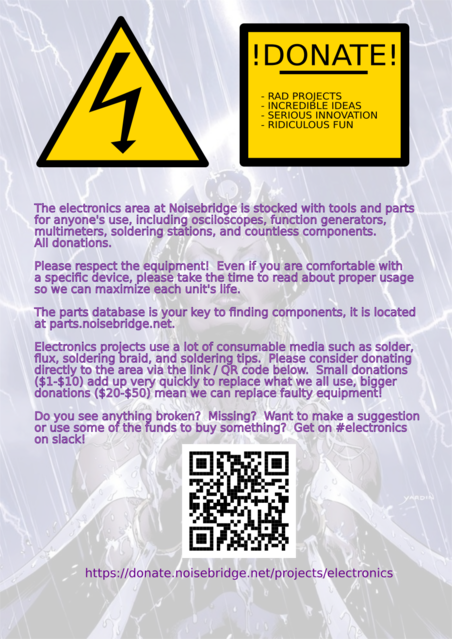 If you have a datasheet URL, copy it in the appropriate field). Once you submit this form, you are automatically placed to the next number, which makes entering quick. First, familiarize yourself with the available category types in the input form. Use it to give a highlevel category to the component you are looking at. For resistors, just write the raw value+decimal suffix. So 100 for 100 Ohm or 5.6k for 5600 Ohm. Use the number of significant digits given on the resistor. If it is a 3 + 1 stripe resistor, these are two significant digits (e.g. 12k), on a (4 + 1) stripe resistor, they are three significant digits (e.g. 23.4k). 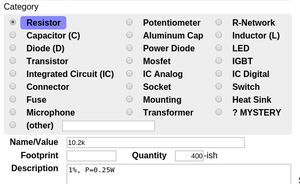 If you know the tolerance of the resistor (gold = 5%, brown = 1%), then add it in the description field. Some component types don't have a value or something, they need a more free-form value, e.g. 8 Pin header, 0.1"
If the component cannot be determined, check the ? MYSTERY category, so that it is easy to find for someone to have another look. If the box is empty, just write 'empty' in the name/value. See popular names for Integrated Circuits on Wikipedia. In the Footprint field, enter the footprint of the part if you know it; Not so much for resistors or capacitors (though distance of leads might be useful: e.g. 7.5mm) Search for TO220, TO-92 or TO-3 for pictures of common transistor footprints to familiarize. Dual-in-Line cases (almost all ICs we have there), are typically abbreviated DIL-something, e.g. DIL14 or DIL16 (for 14 or 16 pins). In the Description field, add a one line description if it is an IC (e.g. Dual Schmitt-Trigger, you find these in the datasheet). For components such as resistors, capacitors or transistors it is good to have some semi-structured way to enter additional parameters of the part, such as Ice=5A, Uce=50V for transistors or P=0.25W for resistors, U=16V for aluminum capacitors. 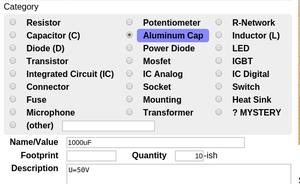 You find these values in the datasheet if you had to search for the part online. If you do electronics, ask yourself what you would like to be able to search for to narrow down to a set of components (I will make searching ranges possible later). Use the Search tab to find examples; e.g. 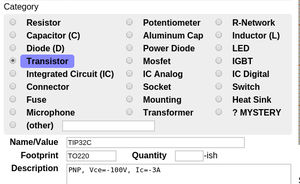 search for 'transistor' to get examples for transistors or 'P=' for resistors that have this value set. Put in notes things that are not really component related, but something like 'needs picture' if it is a really strange part that would be better with an image. If you find a drawer that has one number, but there seem to be multiple components inside, we need to separate them, because there is only one ID per component. If it is only a few stray components between the 'real' components, just sort them out and keep in a mixed-parts drawer -- we can take care of that later, no reason to waste time on this one yet. If the there are more than a few stray components, it makes sense to separate them and put in a separate drawer. Use a drawer that already has a label but is empty - you find them on the status page (they are crossed out), or by searching for it. Put the components you want to separate in that drawer and change the entry in the database from 'empty' to the new value. This page was last edited on 14 March 2019, at 12:52.